I thought I'd start up a thread to document the troubleshooting of my issue (rather than clog up Whirlpool). Firstly - the whole sign-up process was flawless, and the Exetel website and members area is really well done. Great work. 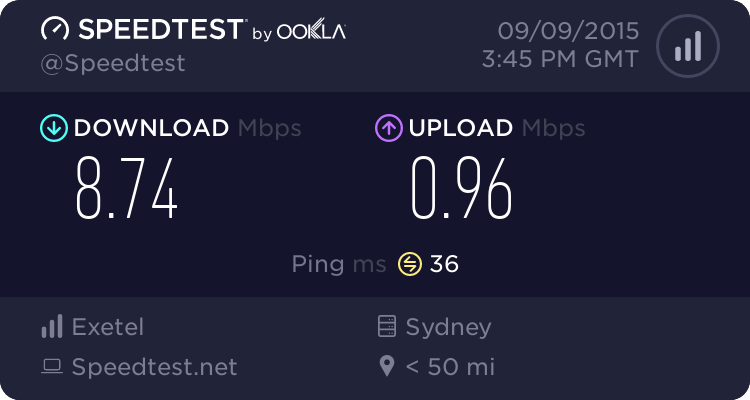 Coming from iiNet this was a nice change. However, my service performance on Day 1 after activation has not instilled me with confidence. 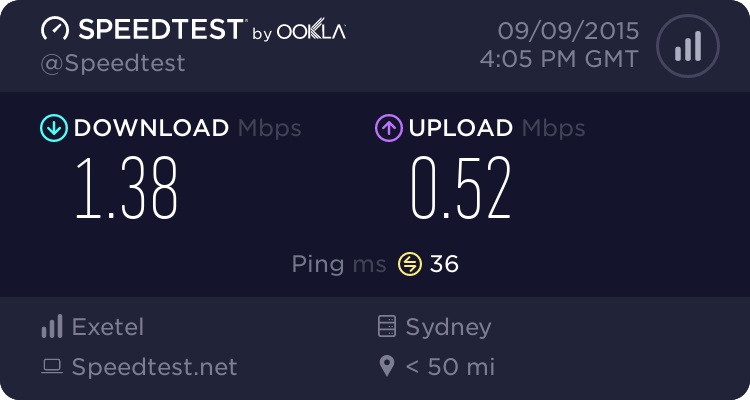 Prior to signing up with Exetel I was with iINet on 100/40 - which ran flat-out 24/7 full speed, and today the service is struggling to deliver 3mbit.. 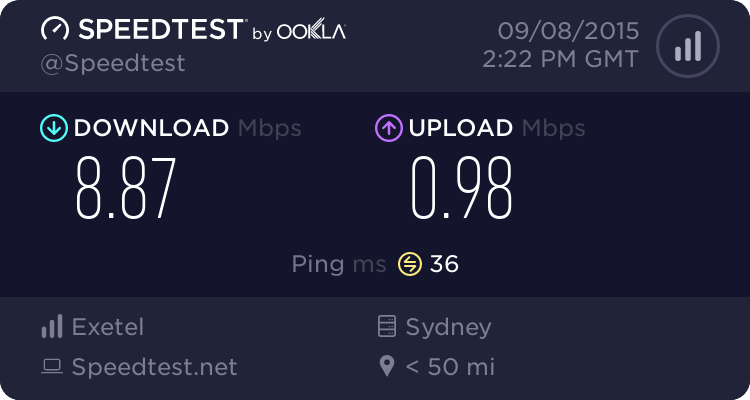 I called Exetel today after consistent speedtests of 2mbit and was asked to reboot the NTD - it briefly came up - but soon dropped back to 2mbit. I was asked to monitor it for 24/48 hours to see if it improves - which I will do - but I'm not hopeful. 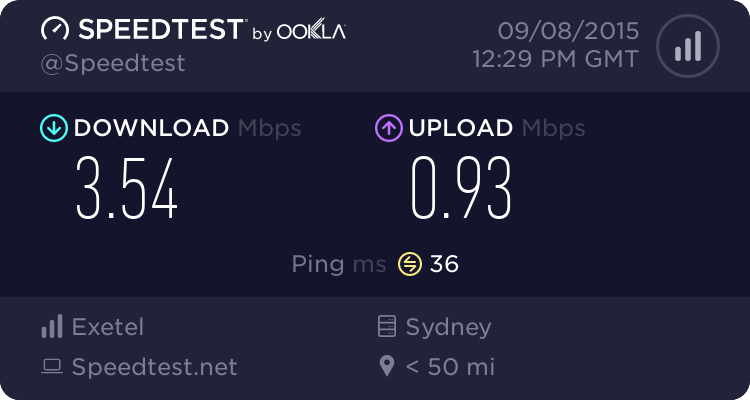 Right now the service is struggling to open Facebook, let alone do any actual downloading/streaming. 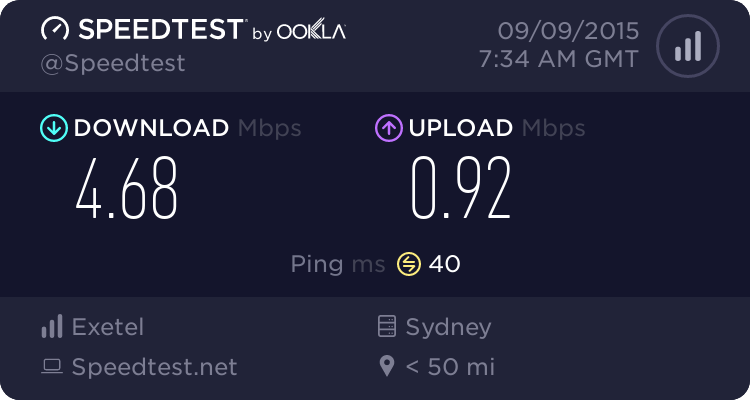 (Full disclaimer, I was a iiNet staff member for 2 years - I left in July this year). Fresh speed test - no improvement yet. Welcome to the Exetel Forum . We have already created in related to the telephone conversation you had. 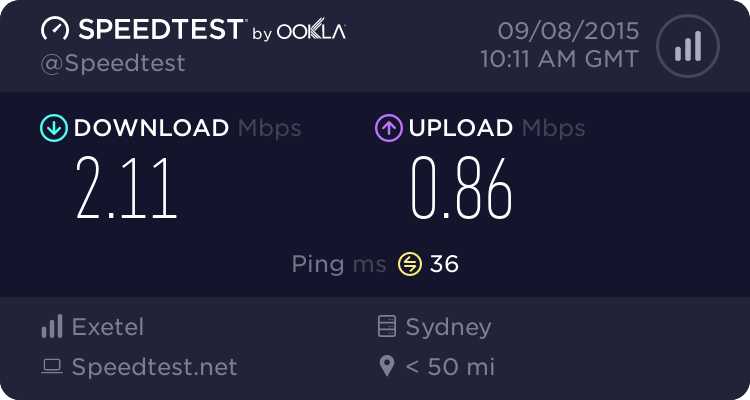 After monitoring the service issue, conduct few speed tests at different times and email the test results to residentialsupport@exetel.com.au, including the reference number 9426964. KavindaS wrote: Welcome to the Exetel Forum . We have already created in related to the telephone conversation you had. 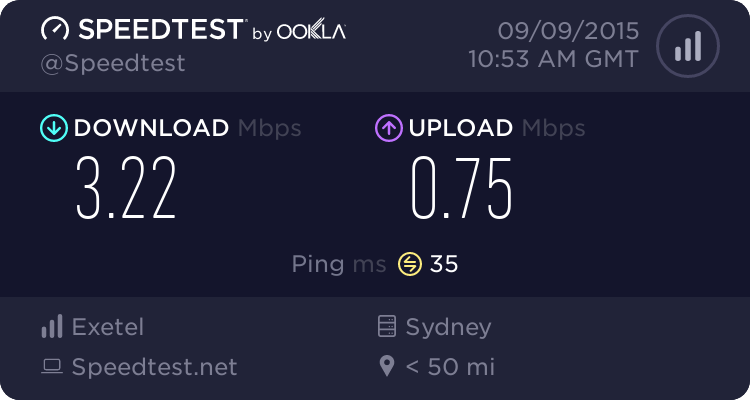 After monitoring the service issue, conduct few speed tests at different times and email the test results to residentialsupport@exetel.com.au, including the reference number 9426964. Right now it's running a lot better (it is almost Midnight though). Starting to feel laggy again. 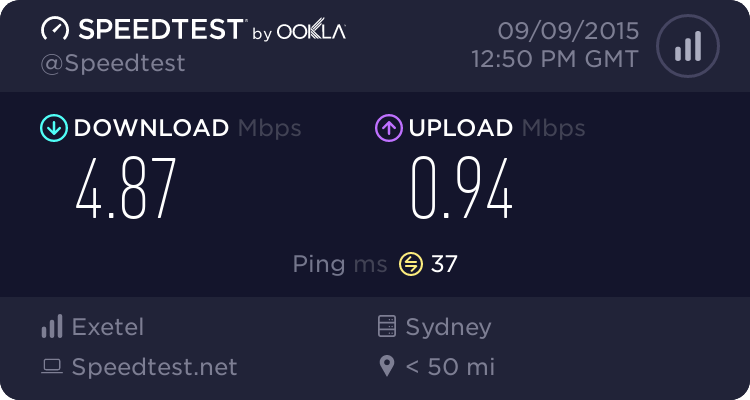 Interesting it at the moment - the service is barely usable - I'm unable to stream YouTube (even at 480p), and Facebook browsing is painful. Which is obviously not correct - so I tried another Speedtest site. Thats about as bad as it can get surely..
Now if predictions are correct, that should be the worst of it and it will start improving again. Slight improvement (as expected). I'm now able to browse, but unable to stream YouTube..
SeanSlater wrote: Slight improvement (as expected). I'm now able to browse, but unable to stream YouTube.. Thanks for the information. It is better that you email as advised early for further investigation. Then we can do further troubleshooting and investigate the matter further with the supplier end. KavindaS wrote: Thanks for the information. It is better that you email as advised early for further investigation. Then we can do further troubleshooting and investigate the matter further with the supplier end. Will do tomorrow - just keeping all the tests here in one spot so I can put them in an email easily. Half an hour later.. and we're back to a usable service..
20 minutes later, it's gone to hell again..